I am watching the Maggie Stiefvater controversy and finding myself thinking that we don't progress as an industry because the internet has developed a new phenomena. The "attack by blog" cowardice from narcissistic sociopaths who use it as a form of passive aggressive expression for their anger management issues. We don't have dialogue - we have attacks. We don't invite debate. We demand rote adherence to a single point of view. We anoint movements as surrogates for real action and change but ignore the others that were on the front lines of the battle. We attack the white speakers, but not the conference organizers who perpetuated the problem. 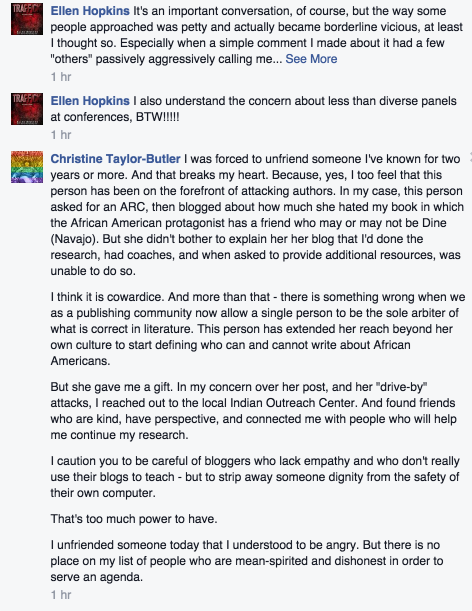 Why attack Maggie, when we didn't attack the authors who were appointed to an all-white male BookCon panel. Children's literature is about creating engaging works for children. Not wars between angry content creators who, unable to pinpoint the true villains, tear down each other. For those who can't conceive of sharing the landscape so diversity has a broader meaning. For those who say whites can't write "other" instead of addressing the real problem which is that those of us who are "other" should be able to write across boundaries, too, I say get out of the kidlit business and write for adults. Because you don't understand where the real problem lies. In that comment, she didn't name the blogger. Because she'd just deleted my comments, I assumed she was talking about me. I had asked her for an ARC. 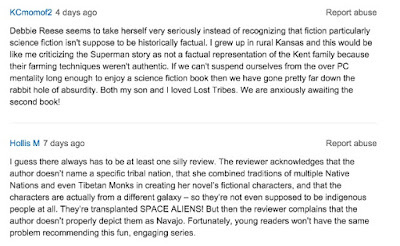 I did review her book, The Lost Tribes. At that point I more or less shrugged it off. 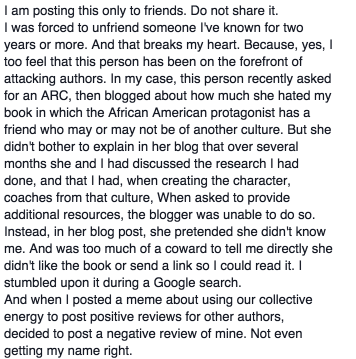 "She didn't bother to explain in her blog that over several months she and I had discussed the research I had done." The reason that line prompted this post? Lot of writers and editors write to me, seeking my help with content specific to Native people. My worry about that line? She was scaring people away from seeking my help. If they assume--like I and others did--that she was talking about me, she was effectively casting doubt on my integrity. Was addressing it, however, buying in to social media drama? 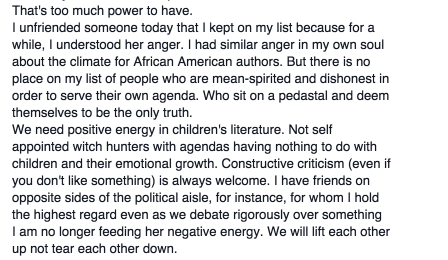 Yesterday morning (Tuesday, September 9), I said (on Facebook) that I was thinking about writing this post. Yesterday afternoon, Christine said (in a comment to me) that she was not talking about me. Other things she said in that comment contradicted that assertion. She deleted that comment, too. I don't have a copy of it. Contradictions aside, I can take her at her word. This post was intended to be my effort to make sense of what Christine was saying. In an early draft of this post, I wrote about our interactions via Facebook and email, quoting extensively from those interactions. I'm setting that draft aside. As Christine's initial post (top of this page) indicates, this is a heated moment in children's literature as we (once again) engage the debate of who-can-write. It is heated in adult literature, too. As I write, people are discussing Sherman Alexie's post about why he decided, in his role as editor of The Best American Poetry 2015, to include a poem by Michael Derrick Hudson, a white man who submitted that poem with the name "Yi-Fen Chou" rather than his own name. I think Alexie was wrong to include it. Writers use pen names for many reasons. Names matter. There are studies that show that people with ethnic names are, for example, denied job interviews, loans, and opportunities to publish. In some of those studies, the very same content is submitted using names like Smith, and those applications get further in the process. Hudson did the opposite thing. He exploited a marginalized population for personal gain. There are excellent responses to Alexie's decision. See, for example, the letter by Craig Santos Perez. I'm on the record, for those who don't know, for preferring Native writers because when a teacher or librarian shares a Native-authored book with a child, that teacher or librarian can use present tense verbs to tell that child about that author and that author's tribal nation, that nation's website, and so on. Those present tense verbs push back on the idea that we're a primitive people, and ideas that we no longer exist. My review recommending On the Move by Flynn, who is not Native is evidence that I think a non-Native person can write a story about Native people. 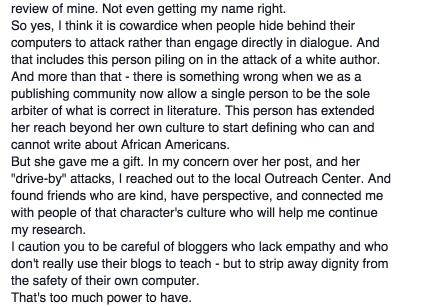 As for what Christine said about bloggers attacking authors? Some writers view negative criticisms as attacks, or, as dangerous. I understand they feel that way to writers, but the work I do here on AICL and elsewhere privileges the children who will read what writers write. Obviously, I disagree with KCmomof2. 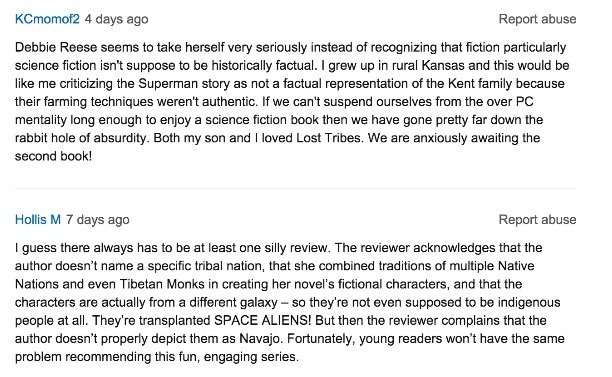 I don't care what genre someone is working in; if there are Native people in the book, the presentation of them must be accurate. I'm also revisiting the premise of the book in its entirety. None of the main characters (including the Navajo girl) are actually human beings. They're all aliens, masquerading as human beings. It is a twist on playing Indian that I find troubling. For the record: It wasn't me who discussed research with her over a period of months. Via Facebook messenger, we talked in November of 2014 about Native identity because she was forming an award committee and wanted me to sit on it to help the committee understand the nuances of Native identity. She never mentioned her book. When I learned about it in January, I asked for an ARC. She told me about the Navajo character, and that Serise (the character) would have a greater role in the next book. I provided her with my mailing address and cautioned her that the people she asks to vet it cannot be the teens she met when she was on the Navajo reservation for two weeks doing missionary work.